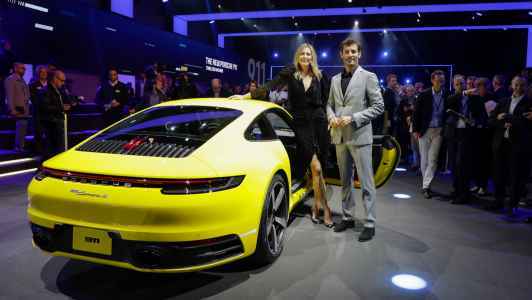 992 revealed Porsche has officially unveiled the eighth generation of 911 at the Los Angeles Auto Show – here’s all the info. 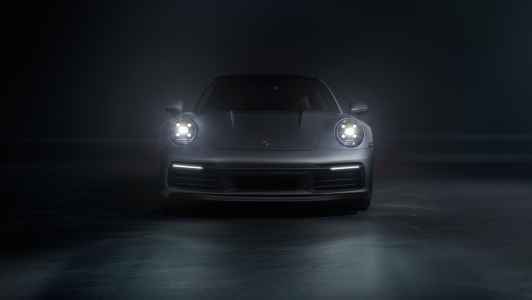 Drive-My heads to Los Angeles as the eighth generation of Porsche’s iconic sports car is unveiled to the world Written by Kyle Fortune in Los Angeles. 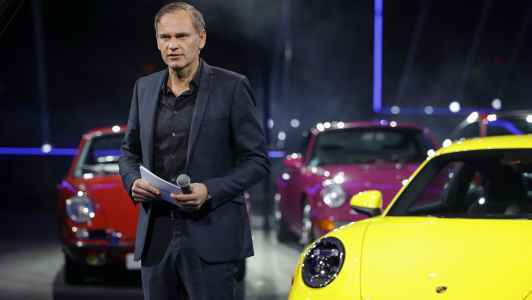 “A new sports car for a new era,” said Oliver Blume, Porsche CEO. 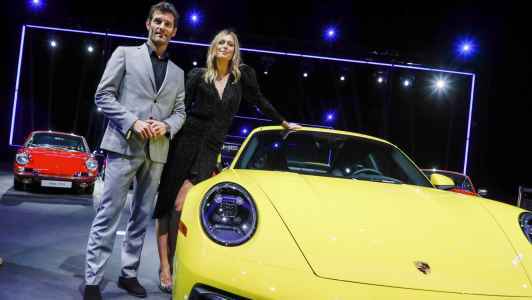 The 992 has finally been officially revealed, the Porsche Experience Center Los Angeles the venue, journalists bussed in on the eve of the LA Auto Show to witness Porsche’s eighth 911 being introduced. Always conscious of its history, Porsche’s 992 reveal was introduced by the seven generations that preceded it – a 1960’s 911 followed by a G-series, 964, 993, 996, 997 and 991 highlighting the global icon’s design lineage, as well as illustrating how big in proportions the 911 has become over the years. 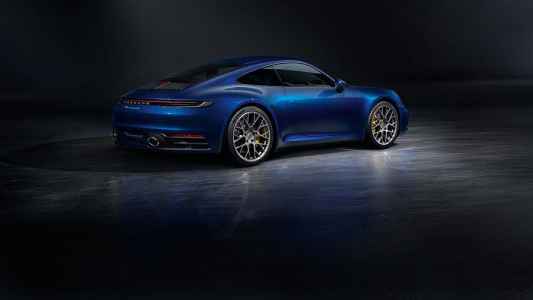 We’ve ridden shotgun already, the 992’s reveal confirming a lot of what we’d already ascertained from that. It’s bigger, the 992 the first 911 Carrera to only be offered in one width. 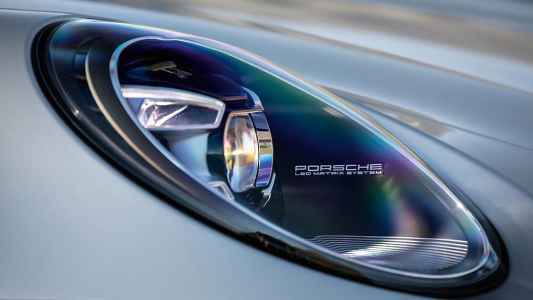 At 1,852mm – or 2,024mm with mirrors – it’s as wide as the outgoing 991 GTS, while at 4,519mm long it’s some 20mm longer than its predecessor. 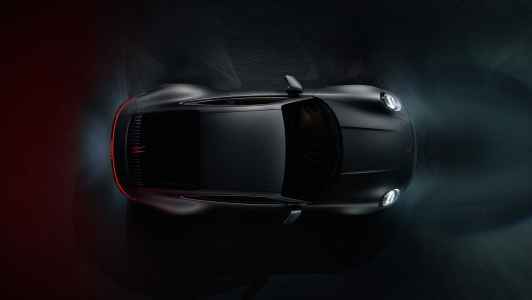 The 992 is a big car, and heavier, too, the 992 Carrera S weighing 1,515kg and the 4S 1,565kg. 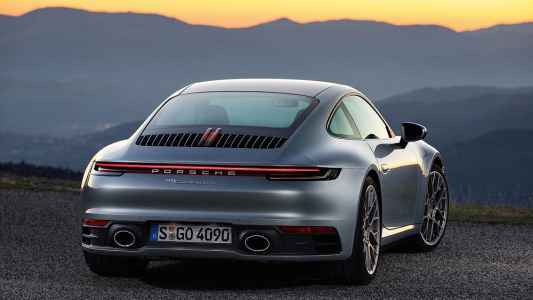 The majority of the weight gain is a result of necessary equipment that allows the 992 to pass ever-more-stringent emissions standards. 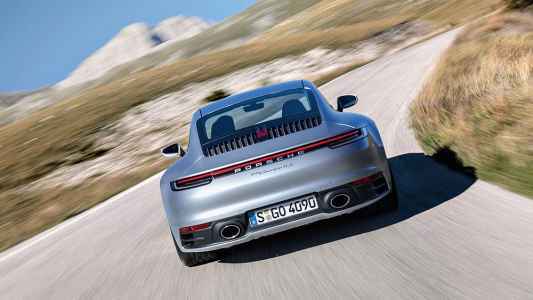 The new Worldwide Harmonised Light Vehicle Test Procedure (WLTP) requires the addition of a pair of petrol filters in the exhaust – these, admits August Achleitner, 911 chief, add 15kg in the worst place: the rear. 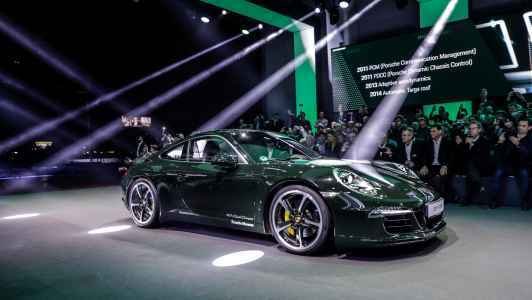 There’s a bigger crash structure up front, too, while Porsche’s decision to future-proof the 992 by making it hybrid-ready has also had an impact on its weight, especially in regards to the eight-speed PDK, which has a space for an eventual electric motor. 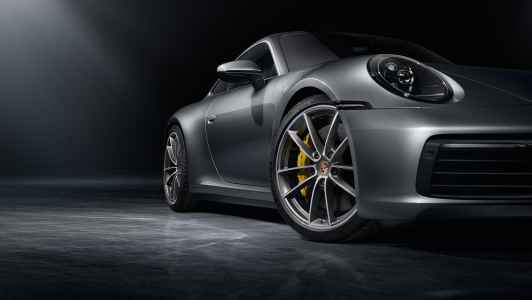 The new PDK adds around 20kg over the 991’s seven-speed PDK unit. That hybrid model is still hypothetical, admits Achleitner, the 911 engineering boss suggesting it will be seen with the Gen2 car at the very earliest. That’s something Achleitner won’t be in charge of, as he retires in the coming months. That overall weight increase is mitigated by Porsche’s use of more aluminium in the car’s structure. 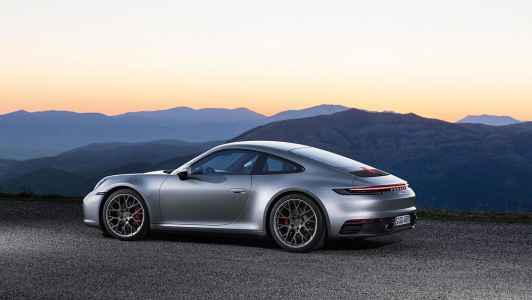 To achieve this most of the 992’s body is now aluminium, the changes particularly useful around the rear where that heavier exhaust and gearbox reside. With all the cars now widebody there’s more metal, too, necessary to cover the 20- inch front and 21-inch rear wheels in 8.5x20-inch front and 11.5x21-inch sizes, wearing 245/35 ZR20 and 305/30 ZR21 tyres respectively. The 992 also gains the staggered wheel stance previously a feature of the GT3 RS model, highlighting the greater performance on offer. 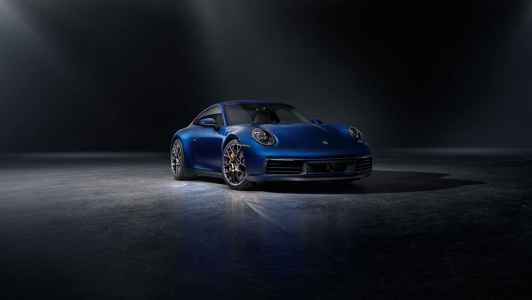 The Carrera S and Carrera 4S’s performance gains are appreciable. 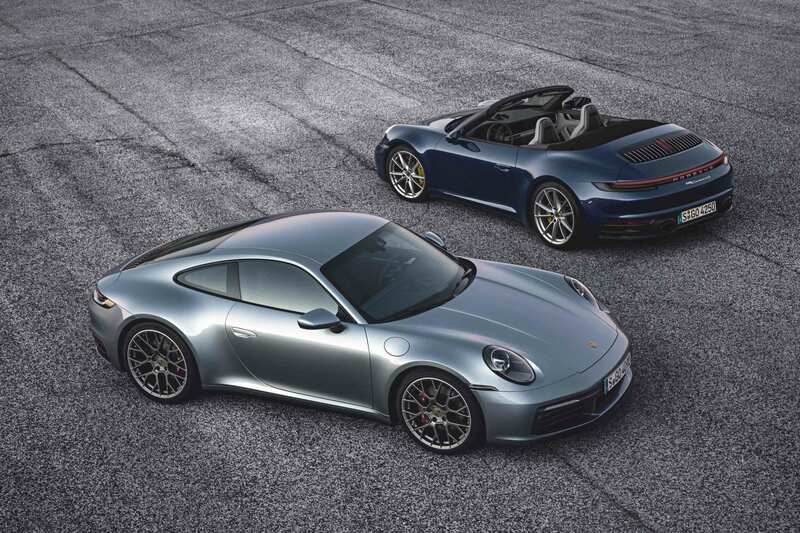 We’re now at a time when a Carrera S can boast performance that once would have been the preserve of the 911 Turbo – the 997 Turbo specifically – with the Carrera S able to reach 62mph in 3.7 seconds and the Carrera 4S using its traction advantage to shave a tenth of that for 3.6 seconds. Those figures relate to the PDK-equipped S and 4S, the manual car not due until July 2019. If you want to go faster still you can order the Sport Chrono Pack, which drops both those 0-62mph times by 0.2 seconds for 3.5- and 3.4-second times, blisteringly quick however you look at it. 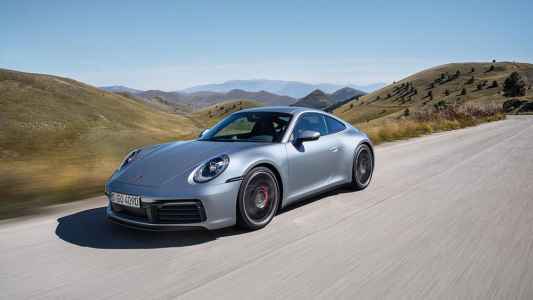 In all, S, 4S, Sport Chrono or not, 124mph is achieved in under 13 seconds on the way to a top speed for the Carrera S of 191mph, with the Carrera 4S trailing that by a scant 1mph for a quoted 190mph maximum. 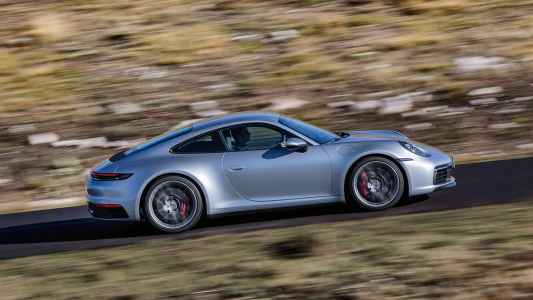 The gains in performance are achieved thanks to a boost in power: the 3.0-litre turbocharged flat six now develops 450hp at 6,500rpm and 530Nm at 2,300 to 5,000rpm, that some 30hp more than the outgoing Carrera S, and the same as the Carrera GTS. Allowing that are new turbos, each side spinning in different directions, this apparently improving the response time. There’s also piezo injection, a new intake system that takes some inspiration from that of the GT2 RS – without any water-injection system. Engine cooling has been one of the biggest hurdles, reducing the intake air temperature not just improving power, but benefitting efficiency, Porsche moving the intercoolers to achieve that. They’re now sat on top of the engine 993 Turbo style, shortening the path for the charge air as well as cooling it significantly. 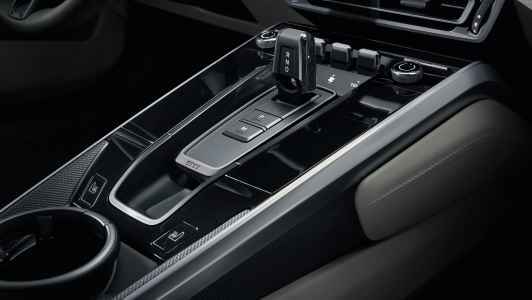 The base block remains identical to that of the 991.2, as are the majority of the internals. Helping do so are recalibrated and additional driving modes. The new selection, and a world first, is Wet mode alongside the more familiar Normal, Sport, Sport+ and configurable Individual driving modes. “It’s necessary,” says Achleitner, who joined us in conversation after the unveiling ceremony “because we have a relatively light car on wide tyres”. The car primes its stability and traction control systems, the PDK shift strategy, the rear wing’s angle of attack and throttle map to suit the wet conditions. It does so acoustically, with sensors fitted in the front wheel housings detecting the sound of water on the road surface. Working independently of the wipers or the rain sensor on the screen, the driver can select Wet Mode, too, either via the mode switch if you’ve optioned Sport Chrono or a switch on the dashboard. Wet mode spearheads a technology creep in the 992 that’s inevitable in the current marketplace. 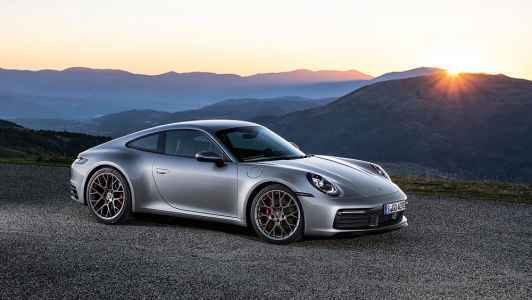 This is a 911 that can be had with Adaptive Cruise Control featuring automatic distance control, Stop-and-Go function, Emergency Assist, Lane Change Assist and Night Vision Assist with a thermal imaging camera. 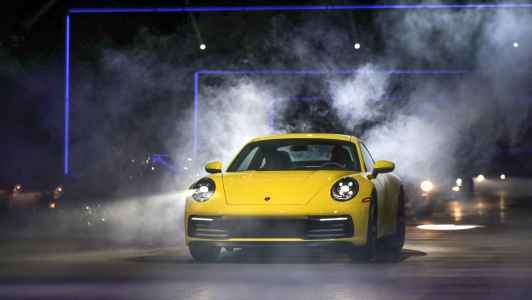 As the world heads towards an autonomous future the 911’s prepared for it, in part, though the purists among you will be happy to learn that most of those driver conveniences are box-tick options. You don’t necessarily need to hand control of your 911 over to the computers yet. Add all those and you’ll be increasing the Carrera S’s price by around £6,000, that money being better spent elsewhere on the options list. More usefully and of interest to a 911 driver is the availability of options like the Sport Chrono Pack: Sport PASM that drops the ride height by 10mm over the standard PASM set-up, and a Sports Exhaust. There’s rear-wheel steering as an option, and if you want PDDC it’s a must-tick option. PCCB brakes remain the only optional brake choice at the 992’s launch, though Porsche Surface Coated Brakes will join the options list in time, and should significantly undercut the £6,000+ of the PCCB option. Whatever your selection the options will quickly add up, pushing the Carrera S’s standard price of £93,110 comfortably above £100,000. It feels worth it, CEO Oliver Blume admitting that “customers expect the best quality”, the interior it and finished at a new level. 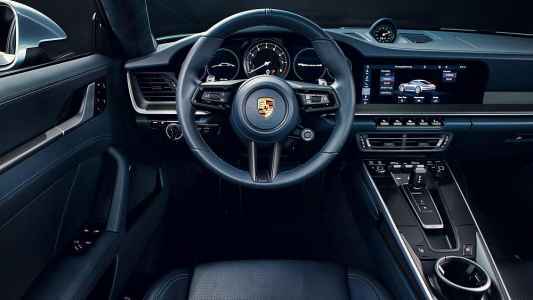 That interior is dominated by a large 10.9-inch touchscreen monitor, within which all the 991’s info and entertainment functions, as well as selectable driving modes, are located. It’s lifted largely from the Cayenne and works well, the 992’s debut adding a few digital applications into the mix. As mentioned in our news section Porsche Road Trip supports drivers in planning and organizing ‘special trips’; when creating curated routes it offers recommendations for hotels, restaurants and attractions along a route. The second new app is Porsche Impact. An emissions estimator, this app allows drivers to estimate the environmental impact of their car usage and enables you to set up payments to approved climate projects internationally to help offset them. Whether that’s useful or desirable depends on each individual customer, but what’s undeniable is the user-friendliness of the new interior. 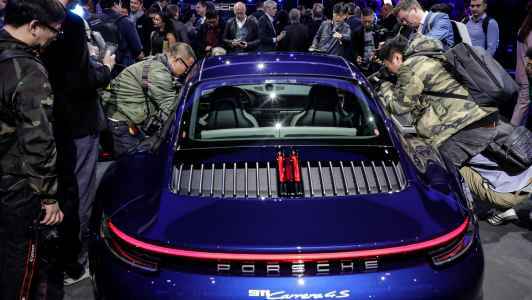 At last the 911 gets useful cupholders, with one on the central transmission tunnel and another popping out of the shelved dash by the passenger-side door. In front of the driver Porsche has thankfully retained the signature dominant rev counter as an analogue dial, it flanked either side by floating screens that can be configured to the driver’s preference, but largely ape the five dials that are a 911 design signature. 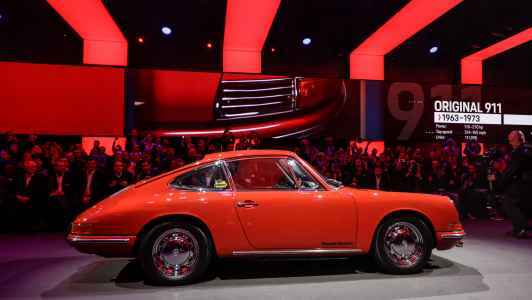 Design boss Michael Mauer admits that designing a new 911 is an honour and, rather unsurprisingly, he’s plundered the 911’s rich history to bring us the 992. 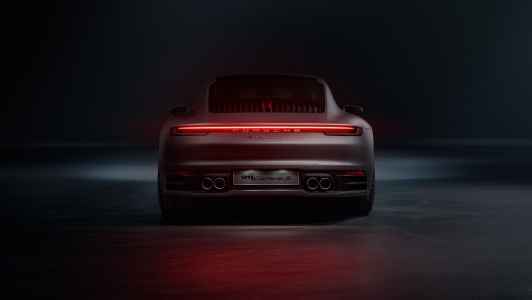 There are retrospective nods all over the design, from the red light strip spanning the rear to the recessed bonnet line, and even the font of the 911 script, which matches that of the G-Series models. 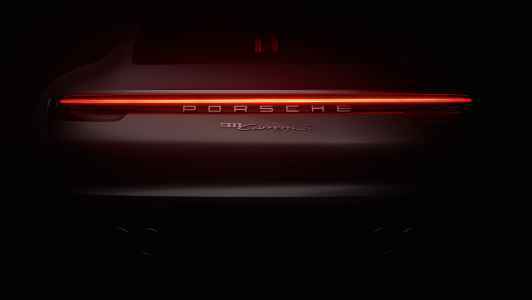 When asked which element of the 992’s design could be symbolic of the new car and might eventually be carried on to future 911s, he points to the upright brake lights on top of the engine cover. “Whenever the 911 passes you should immediately recognise that it is a 911, but you should also realise that it is a new one. That’s one element that really differentiates it,” says Mauer, though he goes on to admit that they wanted it better integrated into the engine cover grille, but legal requirements disallowed it. “There were many discussions about it. It will be one of those parts that you either love it or you hate it, but it gives the car a very strong eighth-generation character. “On the exterior we wanted to have a clean look,” continues the design boss, though he admits that a lot of the design inspiration was centred on the 930 Turbo. “We have very special proportions due to the fact the engine is in the back,” says Mauer, adding that his personal favourite is the 964. 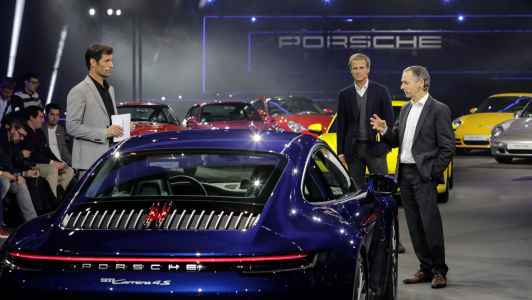 Sitting among its ancestors the 992’s lineage is obvious, and like them it’ll be offered with an expansive model range. 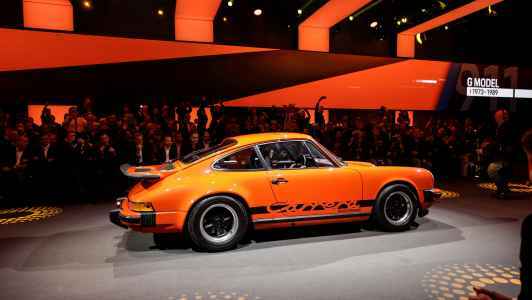 The standard Carrera will arrive mid-2019, its arrival adding the manual transmission to the entire line-up, it retaining a seven-speed manual transmission. The Cabriolet and Targa models will come too, the Cabriolet early in 2019 and the Targa a little later. 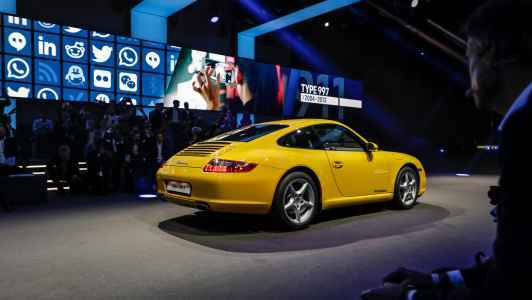 Turbo models will also join the range next year, and a GTS will create the usual bridge between the standard Carrera and GT department cars. 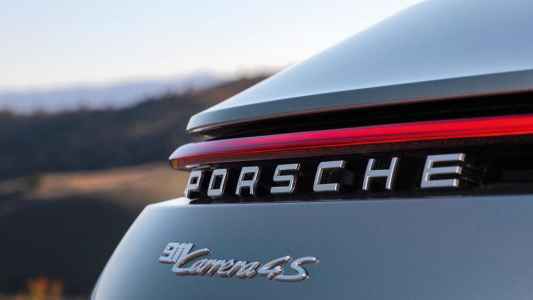 What’s as yet uncertain is whether Porsche will offer a Carrera T, 911 boss Achleitner admitting he’s a fan of the model, but not able to confirm whether it’ll feature in the price lists of the new car. 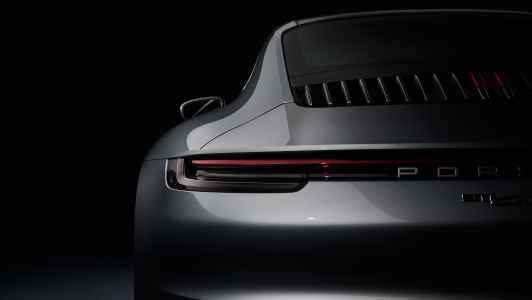 ABOVE New LED headlights and a stylish rear design form key ingredients of the 992’s make-up. BELOW Carrera range will feature staggered wheels for the first time, 20-inch up front and 21-inch at the rear. 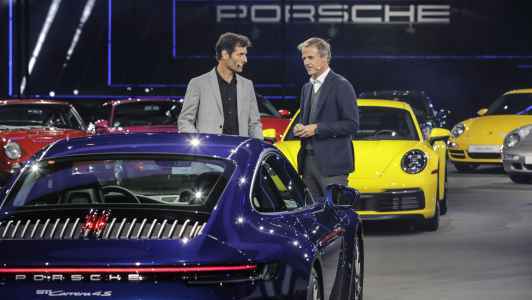 BELOW 911 chief August Achleitner and head of design, Michael Mauer, present the 992 with Mark Webber. BELOW Door skin layout is evocative of G-series cars but digital screens have replaced the five famous instrument dials.